If you’re building applications or deploying infrastructure in the cloud, you need a central place to help understand your security posture, put it in a business context, and act on changes. In March, we announced Cloud Security Command Center in alpha, becoming the first major cloud provider to offer organization-level visibility into assets, vulnerabilities, and threats. Starting today, this security service is available to Google Cloud Platform (GCP) customers in beta. Cloud Security Command Center (Cloud SCC) provides security teams with insight into infrastructure, configuration, application and data risk so that you can quickly address vulnerabilities, mitigate threats to your cloud resources and evaluate your overall security posture. With Cloud SCC, you can view and monitor an inventory of your cloud assets, be alerted to security anomalies, scan cloud storage to discover where you are storing sensitive data, detect common web vulnerabilities, and review access rights to your critical resources, all from a single, centralized data platform and dashboard. The Cloud SCC dashboard presents findings that help you quickly uncover security risks and potential vulnerabilities and threats. For example, you can view which Cloud Storage buckets are publicly accessible, identify VMs with public addresses, discover overly permissive firewall rules, and be alerted to instances that may have been compromised to perform coin mining. 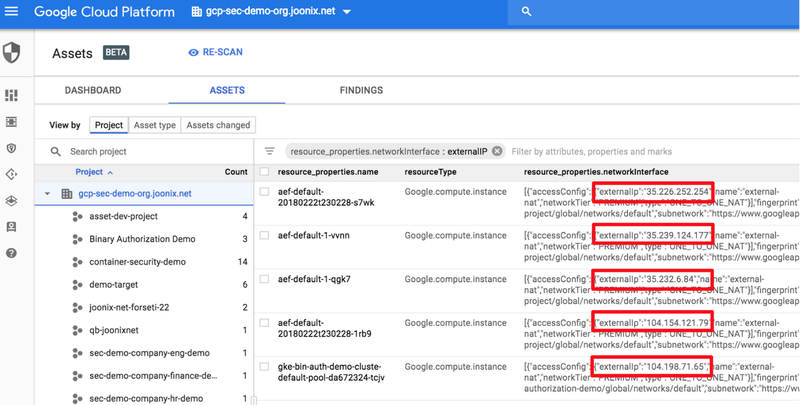 You can also easily see if users outside of your designated domain, or GCP organization, have access to your resources. Cloud SCC gives you a comprehensive inventory of your cloud assets across numerous GCP services including App Engine, Cloud Datastore, Cloud DNS, Cloud Load Balancing, Cloud Spanner, Cloud Storage, Compute Engine, Container Registry, Kubernetes Engine, and Virtual Private Cloud. You can also view the inventory of your service accounts. Using asset inventory, you can view resources for the entire GCP organization or just for particular projects. Cloud SCC performs ongoing discovery scans, allowing you to see asset history to understand exactly what’s changed in your environment and act on unauthorized modifications. With the assets display, you can see new, deleted, and total assets for a specified time period. You can also generate notifications when changes occur and trigger Cloud Functions from a Cloud SCC query. For example, you can configure an action to automatically detect policy changes on a network firewall and then restore it back to a secure state, or detect when a Cloud Storage bucket becomes publicly accessible and then revert back to private access. 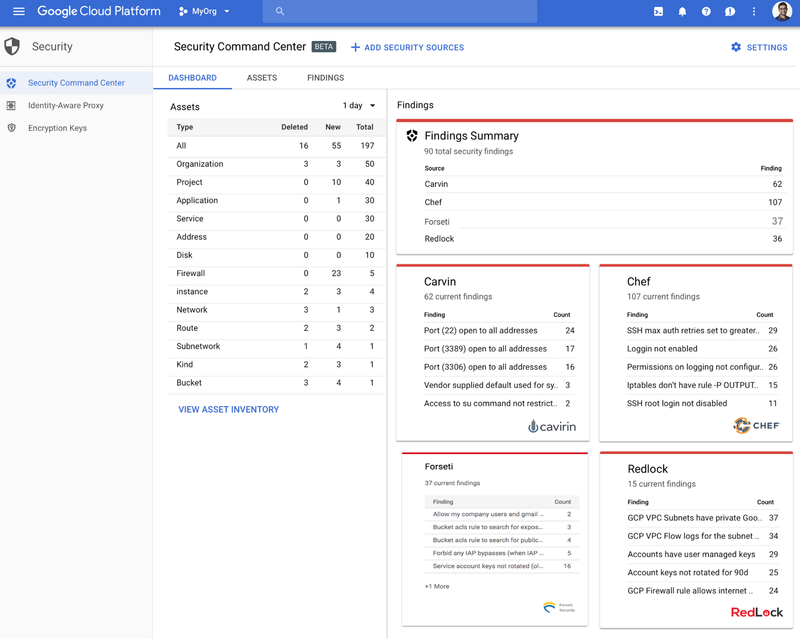 Cloud SCC is a flexible platform that integrates with Google Cloud security services such as Data Loss Prevention (DLP) API, Forseti, Cloud Security Scanner, and anomaly detection from Google as well as with third-party cloud security solutions from vendors such as Cavirin, Chef, and Redlock. By integrating partner solutions with Cloud Security Command Center, you can get a comprehensive view of risks and threats all in one place without having to go to separate consoles. You can also jump from the Cloud SCC dashboard directly into these third-party tools to help speed remediation efforts. Cloud SCC can help you get a better handle on the security of your GCP environment today. Visit the Cloud SCC webpage for a product overview and documentation. You can start using Cloud SCC today, straight from GCP Marketplace. Learn more about the Cavirin and Chef integrations.